The interesting thing about testosterone is that it’s not just a ‘muscle building hormone’. In both men and women, testosterone plays a key role in health and well-being as well as in the prevention of osteoporosis, and maintaining libido. With testosterone being tied to muscle mass, health, bone density and libido, it’s pretty much a given that we should avoid doing things that drastically reduce our testosterone levels. Unfortunately, one of the best ways to reduce our body fat levels can also negatively affect our testosterone levels. Long term calorie restriction CAN lower your testosterone levels, sometimes even as low as those found in eunuchs (a guy who’s been castrated…think about that for a moment). This leads to a bit of a conundrum – Harsh dieting can lead to a reduction in testosterone levels, however, we know from examining large scale (over 1,000 subjects) longitudinal studies (following people for around 8 years) that gaining body fat is correlated with lower testosterone levels, as is just having high levels of high body. Even more confusing is that the very act of losing body fat is able to restore testosterone back to normal levels in overweight people who were low [i,ii]. From this research we can see that having extra body fat can reduce testosterone levels, lowering your body fat can increase your testosterone levels, but dieting can also decrease your testosterone levels. Like I said…Conundrum. If we just left to story right here it would seem that there is almost no way of dieting or getting in shape without somehow messing up your testosterone levels. Lets take a closer look and see if there is a way to get lean without affecting testosterone in a negative way. For starters this research shows us it seems that your diet must be fairly extreme in order to decrease your testosterone levels. There is consistent evidence that mild caloric restriction (about a 15% calorie restriction) does not lead to reductions in testosterone or free testosterone in otherwise healthy men [iii]. We can see that mild dieting doesn’t seem to have a negative affect on testosterone levels, but what about people who diet hard, while training hard at the same time? We can find some very convincing answers to this question in military research. 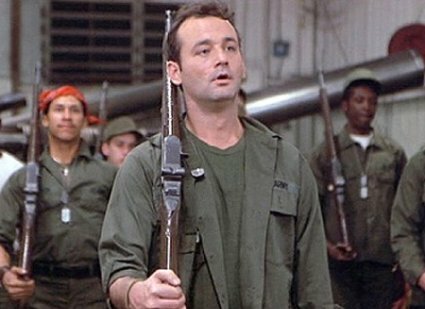 After 8 weeks of extreme multi-stressor environments (very-low-calorie diet, super high energy expenditure, high temperatures and extreme lack of sleep – military training) testosterone levels can drop to almost castration levels…not cool. This military research shows pretty clearly that extreme dieting combined with hard training and lack of sleep can significantly alter your testosterone levels. Most of us aren’t training like we’re navy seals, however let’s be honest- the fanatical way some people approach their diet and exercise can become a little military-ish. And if hard dieting can in fact lower testosterone levels, then maybe we should start paying attention to how hard we workout when we’re also follow a strict diet. Or there might be another solution. In fact it may not be as simple as avoiding decreases in testosterone levels at all costs. Case in point: Not only does a slight re-feed rapidly restore testosterone levels after long periods of hard-training and hard-dieting, but your testosterone levels may actually end up higher within 5 weeks after an 8 week period of stressful dieting and training. These findings lead to another interesting conundrum – Extreme conditions can reduce testosterone, but also may cause a nice rebound afterwards. Could it be that short bouts of low testosterone from hard dieting and training are worth it for the big increase from the rebound afterwards? Similar to what we find with Insulin and Leptin, dieting seems to be capable of increasing testosterone sensitivity. It wouldn’t be illogical to suggest that this may contribute to the increases in muscle mass and feelings of well being that people get after they finish dieting and training for a bodybuilding or fitness contest. Luckily, there may be a way to get the same increases in sensitivity WITHOUT having to go through prolonged periods of chronically depressed testosterone levels. While longer fasts (56 hours and beyond) will cause notable decreases in testosterone, Short-term fasting does not negatively affect testosterone levels, but do allow for short periods of caloric restriction [v,vi,vii,viii]. Fasting intermittently allows for an overall calorie deficit, while also allowing for periods of calorie maintenance. 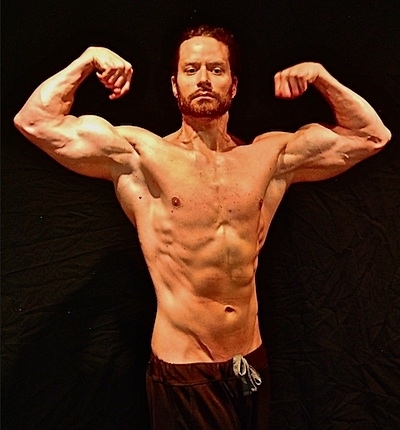 Note from Rusty: Brad Pilon uses intermittent fasting to stay lean without lowering his testosterone levels. These findings all point to the fact that short-term fasting would not cause serum testosterone levels to ever drop below normal, but still allow for a decrease in body fat and possibly even a deficit-induced increased testosterone sensitivity [ix,x]. This might just be the one way to burn fat and get the testosterone boosting advantage of short term calorie deficits, it’s the best of both worlds. 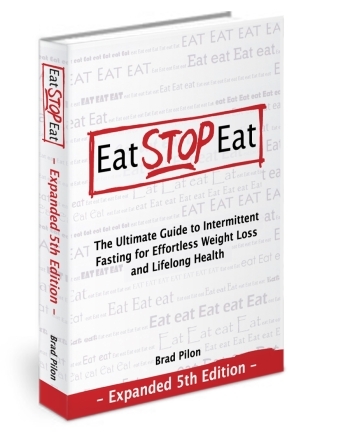 Brad Pilon is one of the world’s most recognized advocates of Intermittent Fasting – You can learn more about his approach to intermittent fasting in his newly revised book Eat Stop Eat. i. Strain GW, Zumoff B, Miller LK, Rosner W, Levit C, Kalin M, Hershcopf RJ, Rosenfeld RS. Effect of massive weight loss on hypothalamic-pituitary-gonadal function in obese men. J Clin Endocrinol Metab. 1988 May;66(5):1019-23.
ii. Pritchard J, Després JP, Gagnon J, Tchernof A, Nadeau A, Tremblay A, Bouchard C. Plasma adrenal, gonadal, and conjugated steroids following long-term exercise-induced negative energy balance in identical twins. Metabolism. 1999 Sep;48(9):1120-7.
iii. Garrel DR, Todd KS, Pugeat MM, Calloway DH. Hormonal changes in normal men under marginally negative energy balance. Am J Clin Nutr 1984;39:930-936.
v. Röjdmark S. Influence of short-term fasting on the pituitary-testicular axis in normal men. Hormone Research. 1987; 25(3):140-6.
vi. Bergendahl M, Aloi JA, Iranmanesh A, Mulligan TM, Veldhuis JD. Fasting suppresses pulsatile luteinizing hormone (LH) secretion and enhances orderliness of LH release in young but not older men. J Clin Endocrinol Metab. 1998 Jun;83(6):1967-75.
viii. Klibanski A, Beitins IZ, Badger T, Little R, McArthur JW. Reproductive function during fasting in men. Journal of Clinical Endocrinology and Metabolism. 1981; 53(2):258-63.
ix. Röjdmark S, Asplund A, Rössner S. Pituitary-testicular axis in obese men during short-term fasting. Acta Endocrinol (Copenh). 1989 Nov;121(5):727-32.
x. Klibanski A, Beitins IZ, Badger T, Little R, McArthur JW. Reproductive function during fasting in men. J Clin Endocrinol Metab. 1981 Aug;53(2):258-63. I am a senior and would like to know if fasting is recommended and how long (days) is safe. When fasting what do you do for liquids? How to you break your fast? What foods would start your fast with and what foods do you end it with? great one rusty. waiting for more such articles. Rusty this is gold! I have an eating disorder ever since last year when I went on a calorie deficit and got abs. In order to keep them, I stayed in the deficit and my body has hated me for it. I lost my abs, lost A LOT of testosterone, and my mental awareness and self confidence has suffered as well. I am only 19(male) and my total testosterone was 113 from multiple blood tests I have taken from my doctor and now my endocrinologists. I didn’t know I was still in the deficit because it just felt normal since I had been in it for so long. He then said I suffered from mild anorexia and I’m trying to fix it. I’m using Leangains right now and trying to implement more calories into my diet. Thank you for this article! Do you think after awhile after implementing more calories my testosterone will fly up? Hey Gordon, Fasting is no way a good practice , so i suggest you to stay away from such practices. have a good life ahead. Nice article. I’ve found that fasting is way better than traditional dieting and makes losing weight much easier. Longtime reader, wish you put out more articles Rusty! alright… to be honest my friend I suggest you if you do it talk to someone around who is doing it so he can make a follow up on you….From my stand point of view if you add JUST APPLES and wáter to your fasting it may be better….it all depends how your body react to such process …I have done it with apples for few days and man it Works ..it really does!! I agree, Fasting is not a good practice !! Hey Rusty,good post with information.Fasting for 2/3days a month can be very effective for weight lose plan.It can burn 30pounds in 30days.But dramatically reducing weight can cause all kinds of health problems. Previous post: Avoiding the Sun to Avoid Skin Cancer? Recent Studies Challenge That Advice. Next post: Squats and Deadlifts are Not the “King of Exercise” for a Lot of People.